One of the hottest features of the new iPhone 4 is FaceTime (video conferencing). It is being reported that a future iOS release (4.1 beta 3) will allow FaceTime sessions to launch by either phone or email contacts. 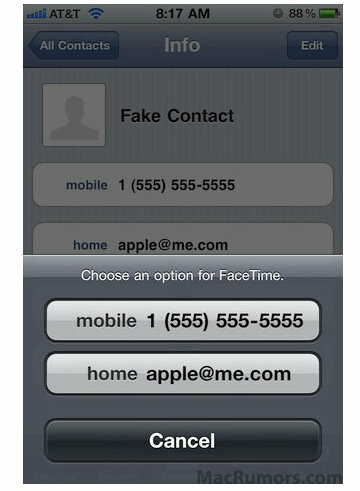 Simply tap a contact’s phone number or email address to launch a FaceTime video conferencing session. The implications for FaceTime connecting via an email address (or a non-phone number) is simple – FaceTime may be coming to both the iPod Touch and the iPad. The iPad device would make a perfect video conferencing tool, and using FaceTime to connect on your iPad would be as simple as tapping a contact’s email address. This new update is said to be available in a iOS update as early as next month.